Daily 1 Hour Free Use of Hearthranger Bot ! Once you registered a forum account (it's also your bot account), then you can use the bot account to start botting. Everyday you can have up to 60 minutes free trial time ! Full Support for All Cards Expansion ! Including the latest 'Rise of Shadows' Expansion ! - Support All Expansion Cards. - Full automatically complete all daily quests. 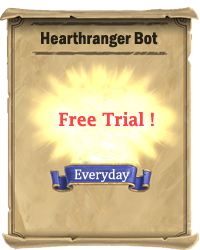 Hearthranger bot can read quests then compose correct deck to complete all daily quests, all you need to do is to start bot ! You can also schedule game & bot start time, then bot can start game and do daily quests from planned time ! - Full automatically complete all tutorials and unlock all heroes for new game account. - Load/Save/Auto Compose Deck ! - Auto Deck Builder ! 1. Full auto complete daily quests. 6. Auto restart game when disconnected. 7. Auto reply opponent's emote naturally. 9. Support all cards including all expansion and new hero skin cards. 10. Support all game servers, all game languages (DE/US/ES/MX/FR/IT/KR/PL/BR/RU/CN/TW/JA) , and all 9 classes. 11. Auto concede by various conditions. 14. Support job list and random deck. 15. Open API and SDK samples, you can program your own A.I. module. 16. Seamlessly integrated silverfish A.I. as an optional external A.I. module. 1. Download rar and extract it to local disk. 2. Run HearthRanger.exe as Administrator privilege. 3. Keep Hearthstone game client running. 4. Setup bot account info and select bot deck in task editor. 2.Click [Update] after connected with bot server.